Degenerative spondylolisthesis occurs when one vertebra slips forward over the vertebra beneath it. It usually occurs in the lumbar (low back) spine in adults. This type of spondylolisthesis is caused by arthritic (osteoarthritis) and normal age-related changes that affect the structural integrity of the spine. Why see a spine specialist for a diagnosis? How is my spondylolisthesis classified? Degenerative spinal disorders can cascade—one thing leads to another— and contributes to spondylolisthesis. Degenerative disc disease and spondylosis typify problems that may adversely affect the spine’s supporting structures, such as the intervertebral discs, ligaments and tendons. Trauma, injury, repetitive movement, improper posture, poor body mechanics, or being overweight can exacerbate degenerative spondylolisthesis. Degenerative spondylolisthesis can progress and worsen. Consult an expert about your back pain with or without extremity pain, pre-existing or changing spinal disorder. An accurate diagnosis is essential to an effective and successful treatment plan. Your medical history and physical and neurological examinations are very important. You and your doctor discuss your symptoms, when they started and treatments tried. The doctor tests your reflexes and evaluates you for muscle weakness, loss of feeling, and signs of neurological injury. Diagnostic testing is important. A simple spinal x-ray can show a spondylolisthesis. Typically, several x-rays are taken: side (lateral), standing (front and back), bending forward (flexion) and bending backward (extension). The flexion/extension studies help your spine specialist to evaluate your range of motion and spinal stability. Other diagnostic imaging studies may include a CT or MRI series. A MRI study is of particular use to assess nerve and/or spinal canal (cord) compression. Your doctor will explain the purpose of these and other tests. 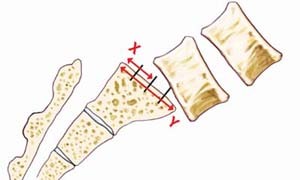 The Meyerding Grading System is used to determine the degree or severity of the vertebral slip. All of your imaging studies, including information from your medical file, are considered in the assessment of your degenerative spondylolisthesis and its characteristics. Most cases of isthmic spondylolisthesis are Grade I or II. Grades III and above are more severe and may require surgical treatment. Often, degenerative spondylolisthesis is treated without surgery. Your doctor may combine more than one therapy to maximize the success of your treatment plan. Degenerative spondylolisthesis can be progressive. This means the spondylolisthesis worsens with time. This is why it is important to follow up with your doctor to monitor your treatment progress and spondylolisthesis. Surgical treatment of degenerative spondylolisthesis aims to reduce (decompress) nerve compression and stabilize the spine (stop the slip). You may be a candidate for a minimally invasive spine surgical procedure to alleviate neurological dysfunction. Spinal stabilization and fusion stops the slip, movement, and holds the spine stable as you heal. Many patients fully recover and enjoy healthy, pain-free, and active lives. We hope this information about degenerative spondylolisthesis has answered your immediate questions. Remember, your doctor is your most valuable source to answer your questions about symptoms and your healthcare.